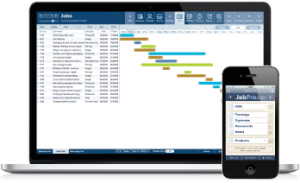 True to the flexible nature of FileMaker it is possible to integrate JobPro with anything that has an API. Below are a few examples of integrations available for your instance of JobPro. Do you already or would you like to have an online shopping cart presence? Your version of JobPro can be integrated with an eCommerce solution such as xCart, Magento, BigCommerce, Drupal eCommerce, Zen Cart or VirtueMart. For more information see our eCommerce page here.